Fugue is an Ultima/Rococo variant inspired by the Rococo with Archers variant. It uses primarily Rococo pieces on Ultimas 8x8 board. The rules of Fugue are identical to those of International Chess, except when noted below. The largest general rules change is that the object of the game is to capture the opposing King, not to checkmate it. Also, a player unable to move or who causes three time repetition loses as well. Fugue is played on an 8x8 board. Each player starts with 8 Cannon Pawns, 1 Pushme-Pullyu, 1 Archer, 1 Immobilizer, 1 Long Leapers, 1 Swapper, 1 Queen and 1 King. The King moves and captures as an Orthodox Chess King. Since victory is by capture of the opposing King, a King may move next to an enemy King. The Queen moves and captures as an Orthodox Chess Queen. The Long Leaper moves as an Orthodox Queen and captures by overtaking. It captures a single intervening piece by leaping to a vacant square somewhere beyond it. Unlike its Ultima and Rococo counterparts, it may not capture additional pieces on the same move. A Long Leaper may never jump over a friendly piece, jump over an opposing piece without capturing it, jump over adjacent pieces or move to an occupied square. The Pushme-Pullyu moves like a Queen, but never to an occupied square. It may capture by approach or withdrawal. 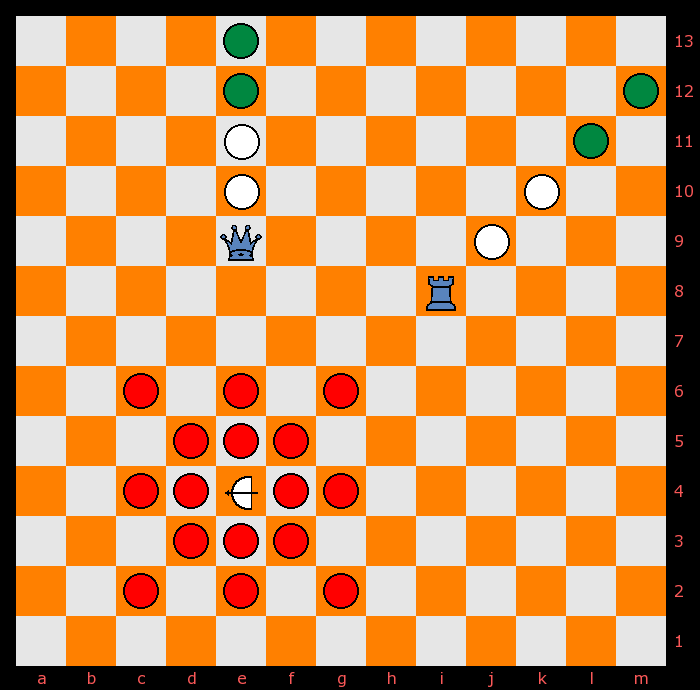 In order to capture by approach, the Pushme-Pullyu must move to a square adjacent to an enemy piece. If the next square in the direction of movement from the square the Pushme-Pullyu stopped on is occupied by an opposing piece, that opposing piece is captured. These captures are part of movement, and are not optional -- you cannot move a Pushme-Pullyu next to an opposing piece in the line of movement and not capture it. In order to capture by withdrawal, the Pushme-Pullyu must occupy a square adjacent to an enemy piece. To complete the capture, it must move one or more squares directly away from the enemy piece. These captures are part of movement, and are not optional -- you cannot move a Pushme-Pullyu directly away from an opposing piece and not capture it. Contrary to the rule in Rococo, a Pushme-Pullyu cannot make both a withdrawal capture and an approach capture in the same move. A Pushme-Pullyu which begins its move by moving directly away from an enemy piece cannot move to a square adjacent to another enemy piece in the direction of the move. As a result of this, in a position like Pushme-Pullyu on b5, enemy Pawns on a5 and d5, the Pushme-Pullyu cannot capture either Pawn. 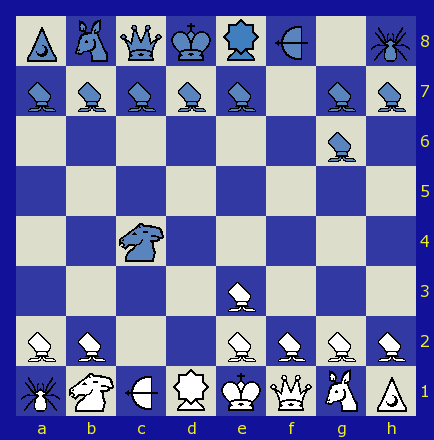 The Swapper moves as an Orthodox Queen without capturing, or may swap position with any piece (of either side) an unobstructed Queen's move away, excluding the enemy Swapper. Additionally, a Swapper may capture an adjacent piece (including the enemy Swapper) and itself at the same time by mutual destruction. Mutual destruction may not be used when immobilized, and may not be used on a piece protected by a Shield. A swapper may swap with an immobilized piece or a piece protected by a Shield. The Archer moves as an Orthodox Queen without capturing. It captures by shooting: an Archer can capture an enemy piece an unobstructed Queens move away without moving. There is no restriction on shooting an enemy piece adjacent to the Archer or two squares away; for longer shots, some other friendly piece must spot the target by being adjacent to it or two squares away in an unobstructed straight line. An immobilized Archer cannot shoot, but an immobilized piece can spot for the Archer. The Immobilizer moves as an Orthodox Queen but does not capture. An enemy piece standing adjacent to an Immobilizer may not move while the Immobilizer is present. Enemy Immobilizers occupying adjacent squares do not immobilize each other, unlike Immobilizers in Ultima and Rococo. The suicide move of Ultima and Rococo is not allowed. The Immobilizer may never move to an occupied square. The Shield moves as an Orthodox Queen but does not capture. A friendly piece (including the King!) standing adjacent to a Shield is immune from capture. The Shield itself is capturable. The Shield does not protect against immobilization, but an immobilized Shield still protects adjacent friendly pieces. The Shield may never move to an occupied square. The Pawns in Fugue are Cannon Pawns, identical to their Rococo counterparts. Their move is rather like a limited form of the Cannon from XiangQi (although, their move is even more like the fairy Chess piece called the Grasshopper). Cannon Pawns move without capturing two ways: either a single step in any direction, or, they may leap over an adjacent piece of either side to the empty square just beyond. They capture the in the second way they move, by leaping over an adjacent piece (the mount), landing on the opposing piece just beyond the mount. An immobilized piece can act as a mount. If a Cannon Pawn makes a move by itself (rather than being swapped) that lands it on a square on the eighth rank, it may optionally promote to any friendly piece other that has been captured and is currently off of the board. The Immobilizer is the strongest piece in the game: it can take a lot of enemy pieces out of action and an immobilized King is a sitting duck. The Shield created strong defensive formations of uncapturable pieces. It is a strong protector for the King but also has offensive potential by protecting your attacking pieces from counterattack. Much middlegame strategy will revolve around capturing these two pieces. Setting up long shots for the Archer is a common theme as well. This is easier to do on the defensiveput an Archer on your third rank and your Pawn line does the spotting. Cannon Pawns are not quite as strong as in Rococo as the Archer is quite good at picking them off. For this reason, combinations directed at the Archer are quite useful. You kill his Archer and he doesnt kill yours, then you go on picking off his Pawns while pushing yours forward. The Queen is powerful but not in any way dominating. The Pushme-Pullyu is very strong and about equal to the Queen. The Long Leaper is weaker than in Rococo because pieces can hide on the edgebut this makes it well suited to forcing enemy pieces to the edge when the action is in the center. The Swapper is not as powerful as many of these pieces, but it is an excellent two-way piece. Its swap move is very useful on both offense and defense. It can swap with an immobilized piece and rescue it at the cost of being immobilized itself, or it can swap with the enemy immobilizer. Swapping with the enemy Shield can be used to expose protected piece from attack, or a single protected piece can be swapped away from the Shield. The recent discussion of Rococo variants inspired me to try my hand at designing one. The common theme was getting rid of the second long leaper and adding a new piece. I was particularly impressed by the Archer, so I used it, strengthening it as above. I have never liked the Withdrawer because it is so weak, so I also eliminated it and replaced the Advancer with a Pushme-Pullyu. I added the Queen as used in Roberto Lavieris Ultima variant Ultimatum. At this point the game had an immense amount of offense and little defense. So I eliminated the Chameleon, invented the Shield (Im sure its been invented before) and weakened the Long Leaper and Pushme-Pullyu by the single capture rule and using the Ultima board rather than the Rococo board. The resulting game has a pleasing balance of offense and defense. Fugue has some of the feel of Rococo and some of Ultima, but it really is a third thinga new development in the Ultima family. The name was one of several suggestions by Roberto Lavieri. The fugue as a musical form originated in the Baroque period, and continued through the Rococo period and on into the classical period. This is well suited for the feel of this game: some Ultima (=Baroque), some Rococo and some elements not found in either game (=Classical). Click on the above link to view logs of Fugue played on Game Courier. Yes, in the position cited, either of the the Cannon Pawns on a2 and e2 can act as spotters for Archer on c1 shoots Pushme-Pullyu on c3. No other friendly pieces can spot in this position. Suggestions of how to reword the rule to make this clearer are in order--as well as any other rewording: I plan to revise this page for clarity (no change in substance). Perhaps a general statement before the specific piece description such as "All pieces act on orthogonal or diagonal lines in any direction (though in some cases, limited by distance)." I'm also thinking it might make the capture rule clearer to phrase it in terms of all shots require a spotter, but if close enough, the Archer can spot for itself. Editors, which would be easier for you: to review submissions for revised pages, or to grant me editing rights to my own game pages--I am comfortable with either. The Jeremy's last question, "In the current position of the game I cite, can the cannon pawns on e2 and a2 be seen as spotting the piece on c4? ", has not been explicitly answered. The rule should reflect the real situation of an archer trying to hit the target when the victim is located at longer distances and needs help for focusing the shot, hence the role of the spotter. The following diagram shows how I understand the matter. Red circles indicate all the possible short range captures. White circles indicate the possible positions from which the spotter would fulfill its role. Green circles indicate positions from which any white piece [archer's friendly] would not fulfill the spotting role. But this is only a personal interpretation and I'm, of course, willing to abide Michael's statement. Jeremy, your interpretation is correct. I will state the rule more completely for the benefit of others. 1. The Archer moves without capturing as a FIDE Queen (like most pieces in Ultima family games). 2. The Archer captures an enemy piece by shooting, that is, the player owning the Archer declares that a particular enemy piece is to be shot, then removes that piece from the board. 3. An Archer may shoot in any direction in which it may move. 4. An Archer may shoot an enemy piece which is adjacent to it without restriction. 5. An Archer may shoot an enemy piece two squares away from it in a straight line provided that the intervening square in that line is empty. 6. An Archer may shoot an enemy piece more than two squares away from it in a straight line if a) the intervening squares in that line are empty, and b) another piece friendly to the Archer is located adjacent to the enemy piece or two squares away from it in an unobstructed straight line (in any direction). It is not relevant whether or not the other friendly piece could move to the enemy piece's square. Thanks for your consideration. Okay, I think I mis-stated the real question in 2009. I think my friend and I agree that the spotter is the same side as the archer. If I understand correctly, the question is really where does the spotter have to be? * Behind the victim? (I think this is my friend's interpretation). * Or anywhere within two spaces in a straight line (diagonal or vertical or horizontal) from the victim? (My interpretation). In the current position of the game I cite, can the cannon pawns on e2 and a2 be seen as spotting the piece on c4?